A radical equation is an equation written with a radical. To solve a radical equation, type "root," enter the index in brackets and the radicand in parentheses. Enter one equation per workspace. 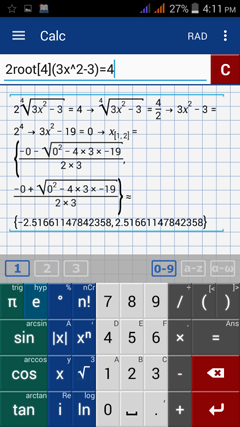 You can also use the root key and its functions (square root, cube rooth, 4th root). Solve each radical equation below. 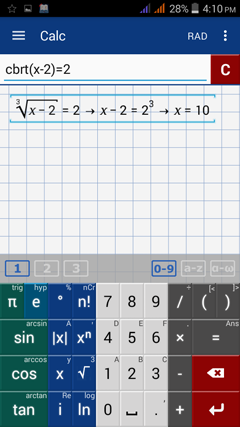 1) Enter the equation using the square root key next to x: sqrt(2x - 1) = 3. 2) Enter the equation: sqrt(3x^2 - 2) = 5. 3) Enter the equation by tapping the square root key twice to enter a cube root: cbrt(x - 2) = 2. 4) Enter the equation: 2rootx^2 = 2 with index 4 in brackets. 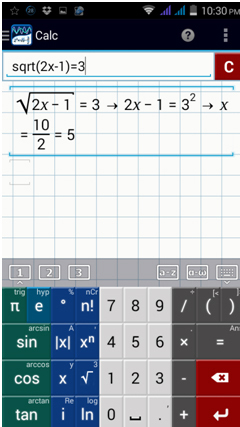 ​Type "root" using the a-z keyboard and enter brackets by tapping the parentheses keys twice. 5) Enter the equation: 2root(3x^2 - 3) = 4.